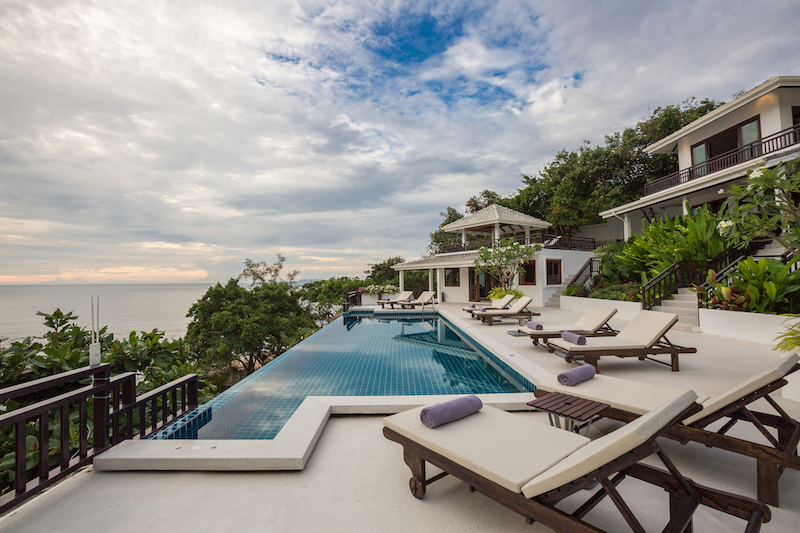 Secret Beach villa, 6 Bedrooms, infinity pool, fantastic views and a private beach. 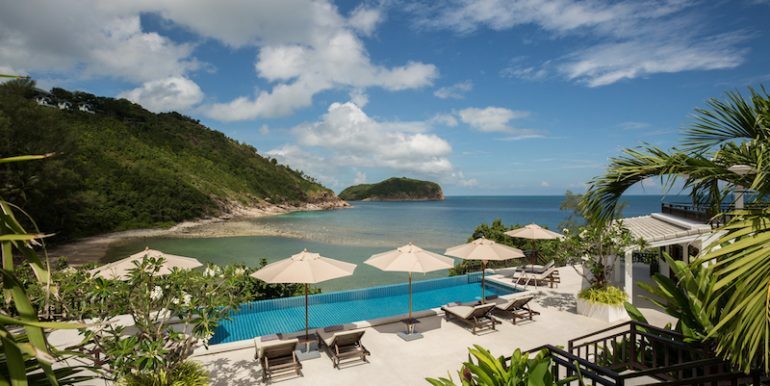 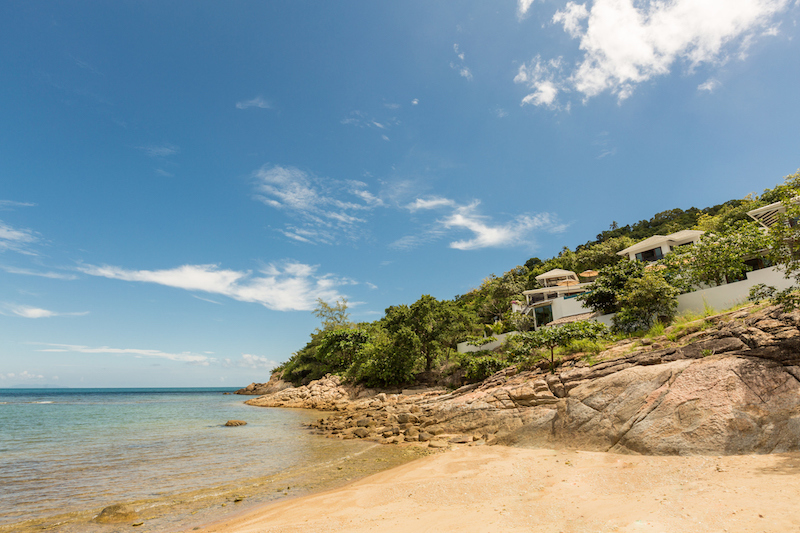 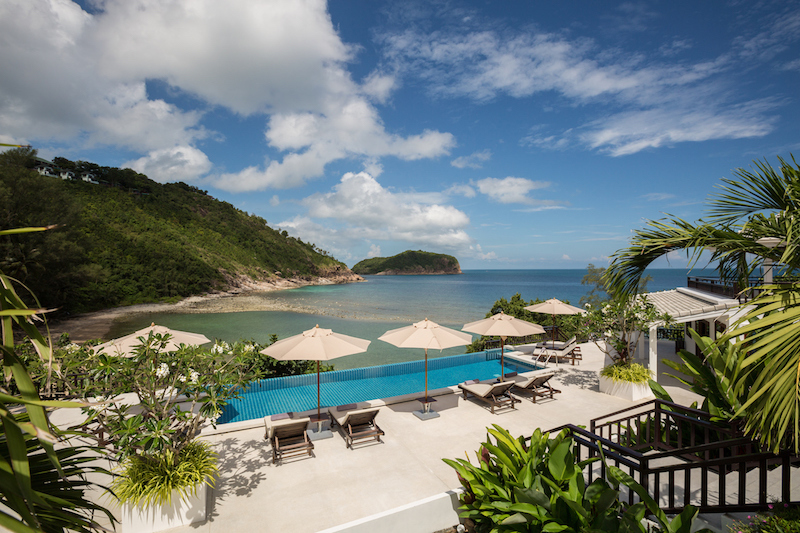 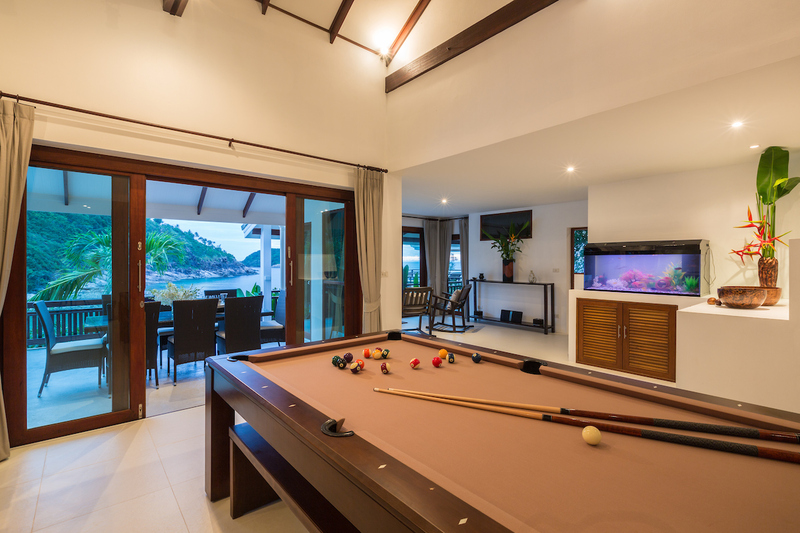 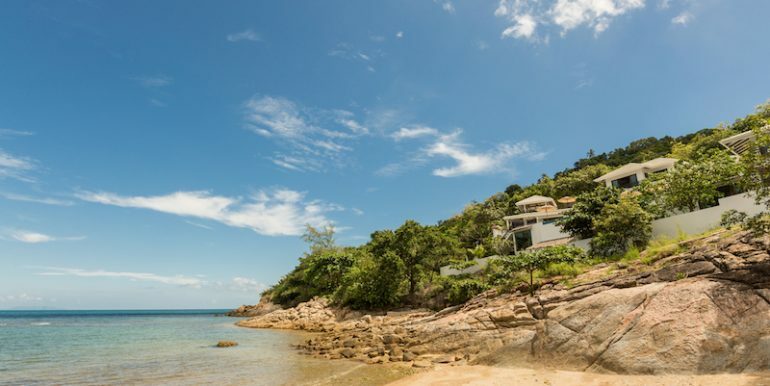 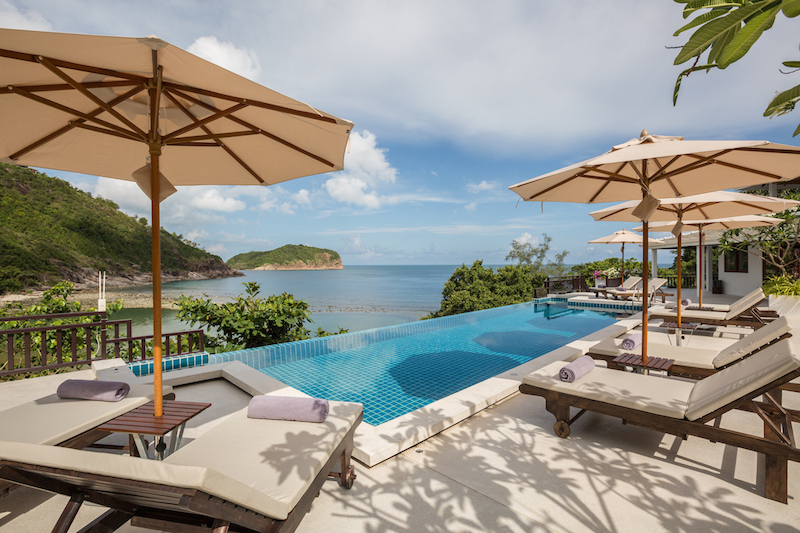 This spectacular villa overlooking the secluded beach bay of Haad Thong Lang in the North West of Koh Phangan. 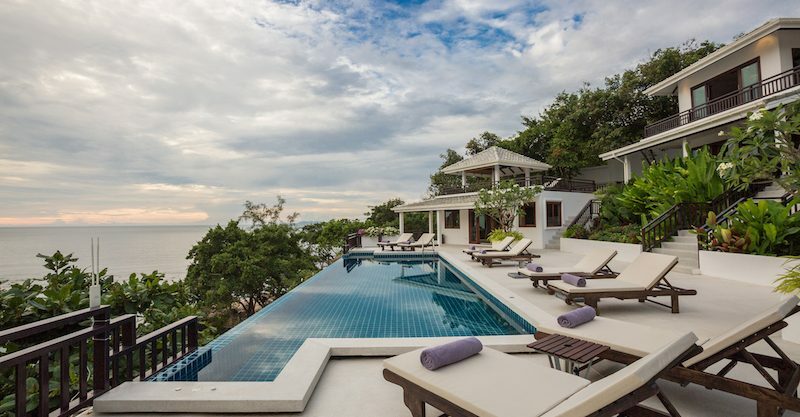 This villa faces West so it gets the best view of the sunset every day. 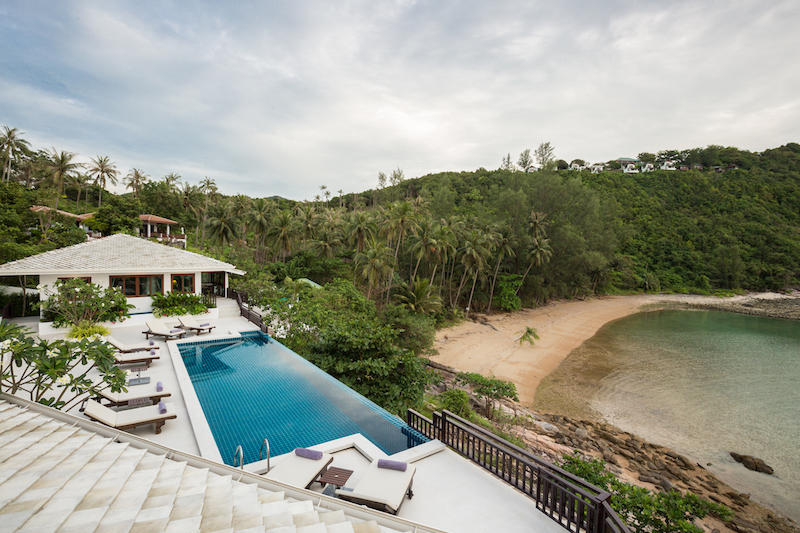 The Secret Beach villa is Neo colonial designed complex of 3 villas with 6 bedrooms, designed by a French-Japanese couple who fell in Love with Thong Lang Bay, Koh Phangan. 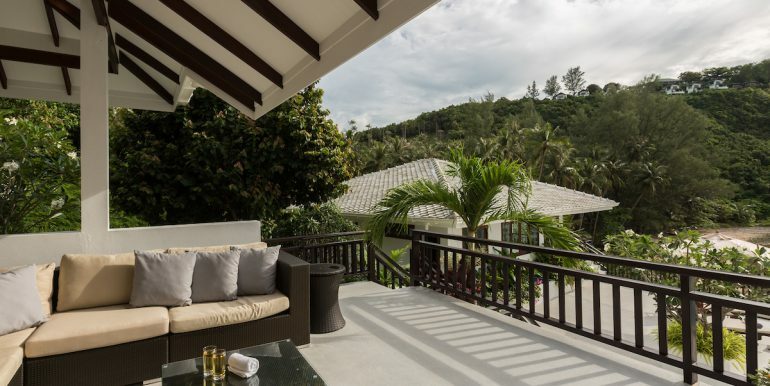 The luxury villa is built just above the beach, giving any guests the luxury of their own private beach which are only a few steps away from this villa. 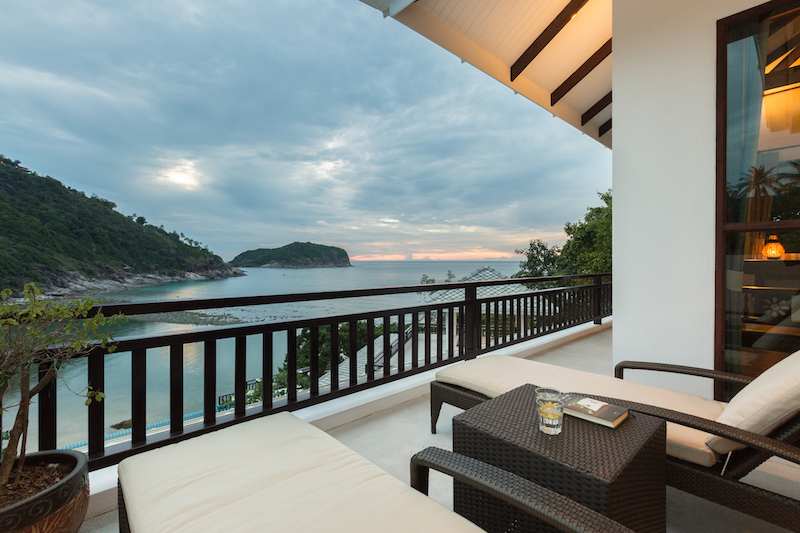 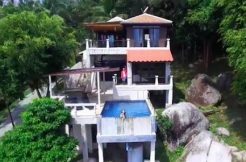 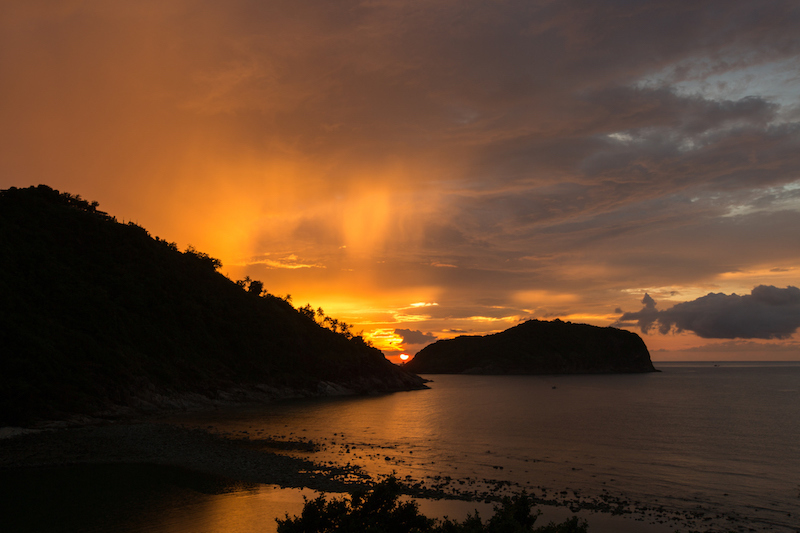 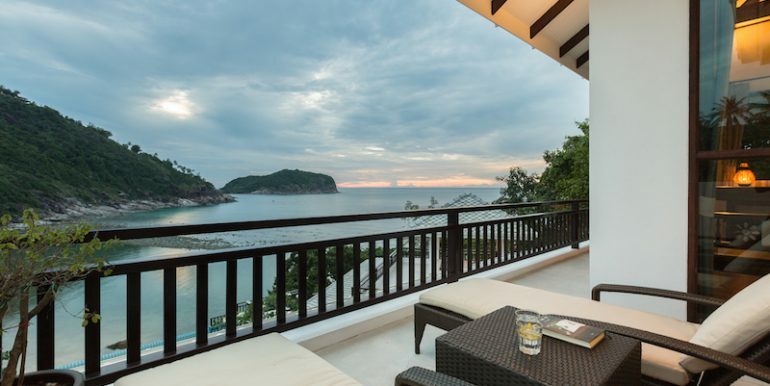 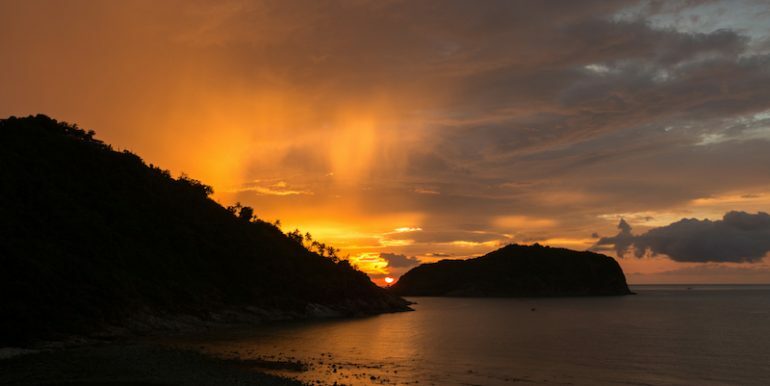 The location is unique and has beautiful views of the lush tropical jungle meeting the sea and the nearby Koh Ma Island. 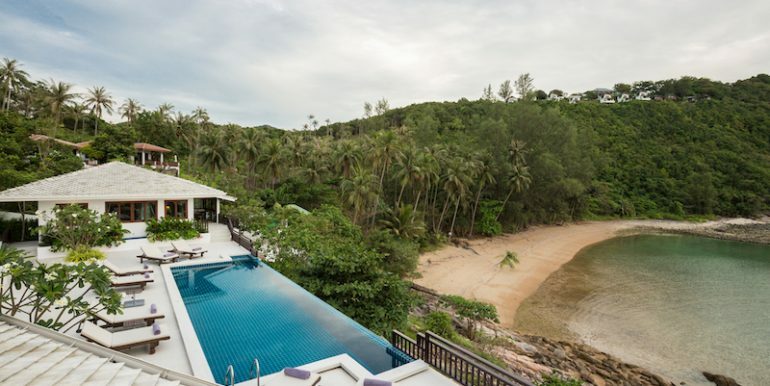 The Secret beach villa is based on a few levels, constructed to take advantage of the view and to make every part of the villa easy accessible. 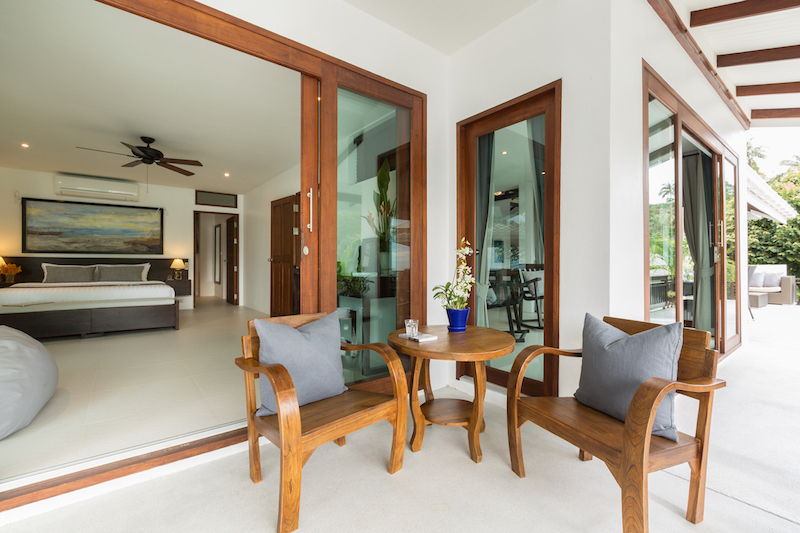 Large windows are used all-round the property to take advantage of light which generates a feeling of bright and clean. 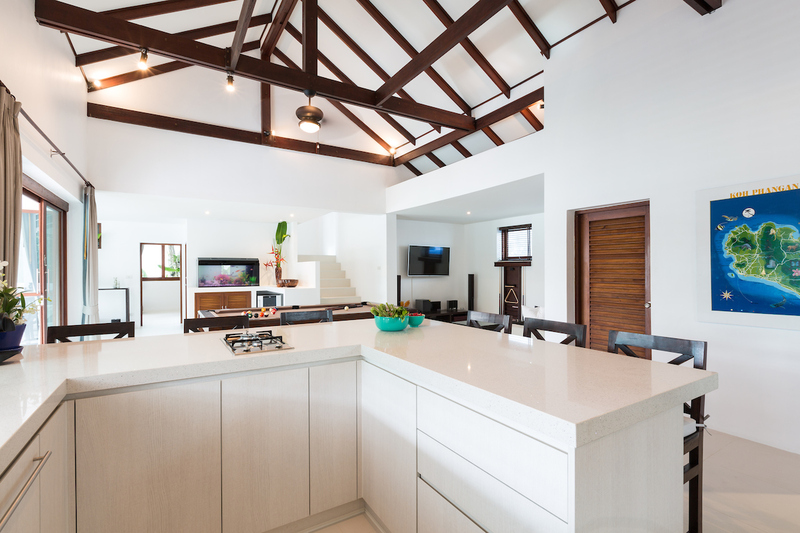 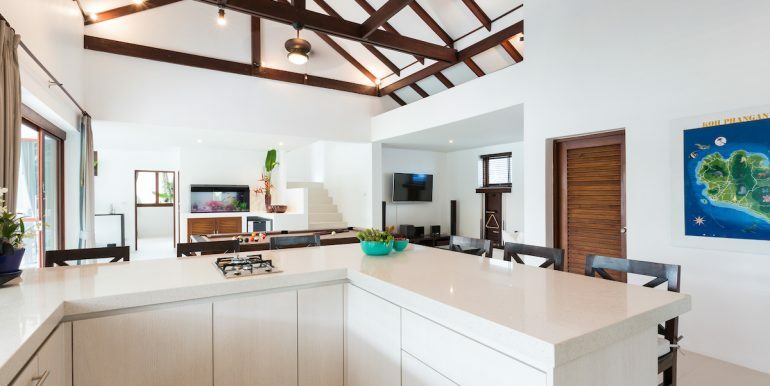 The main living room and dining area are set with white walls and white vaulted ceilings, set against beautiful Thai wooden trusses, the result gives a result of clean and modern style, which also adds class and character. 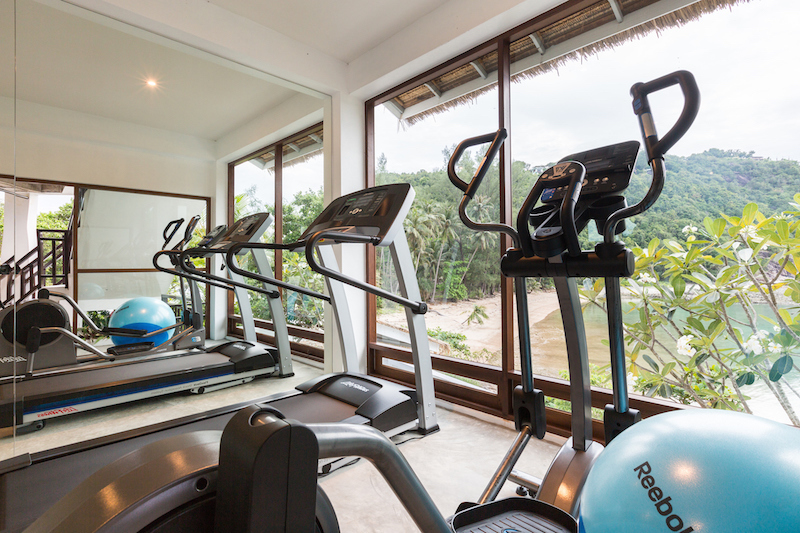 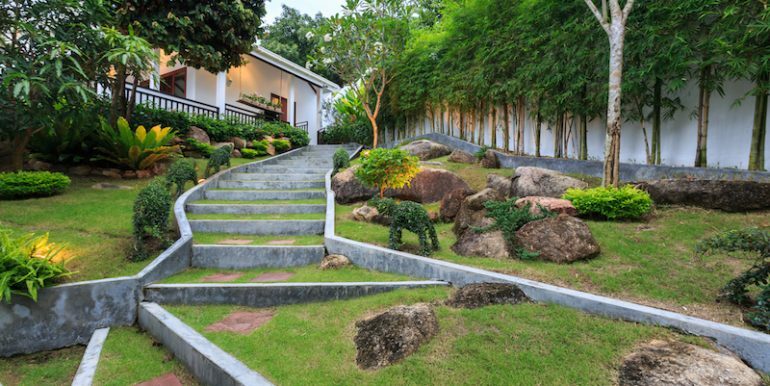 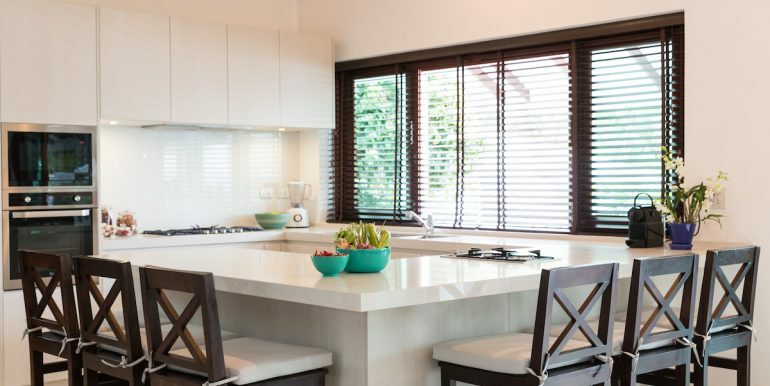 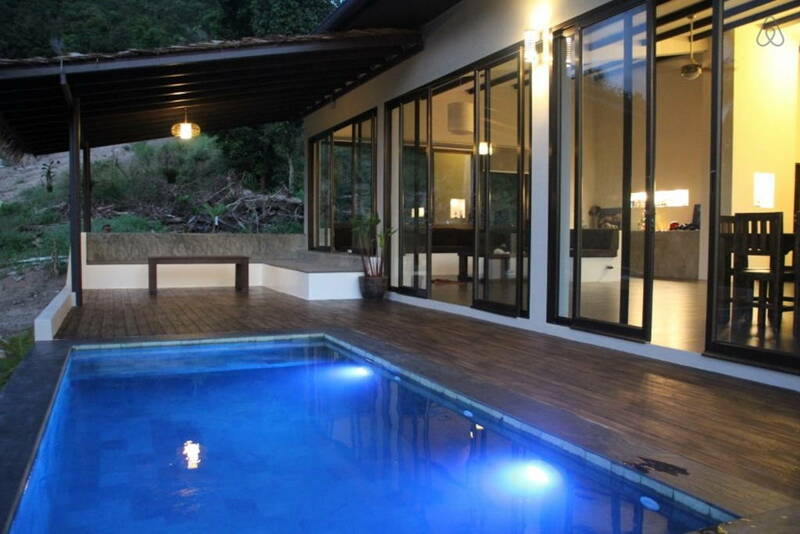 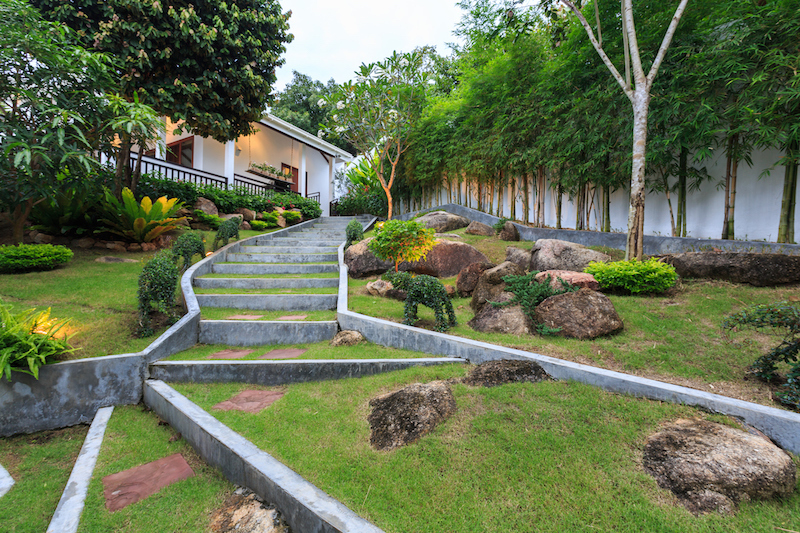 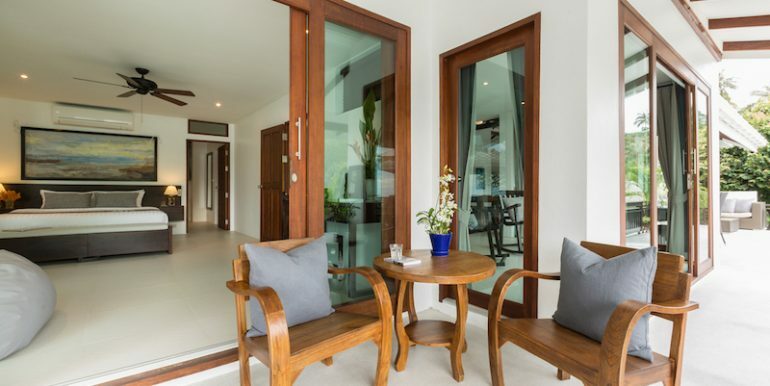 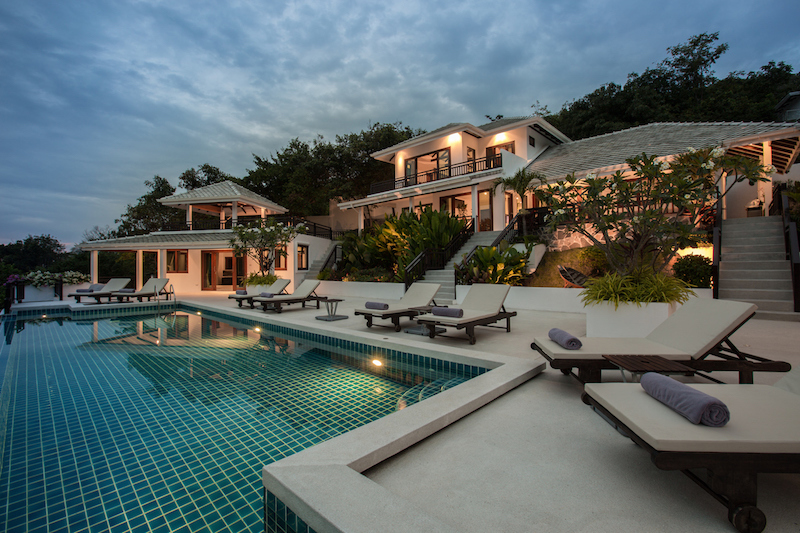 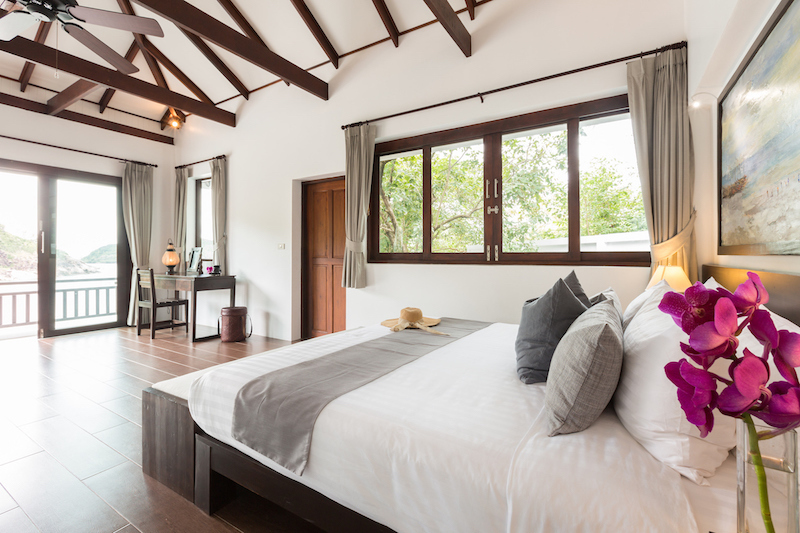 The villa has a lot of traditional Thai elements all set in a modern style. 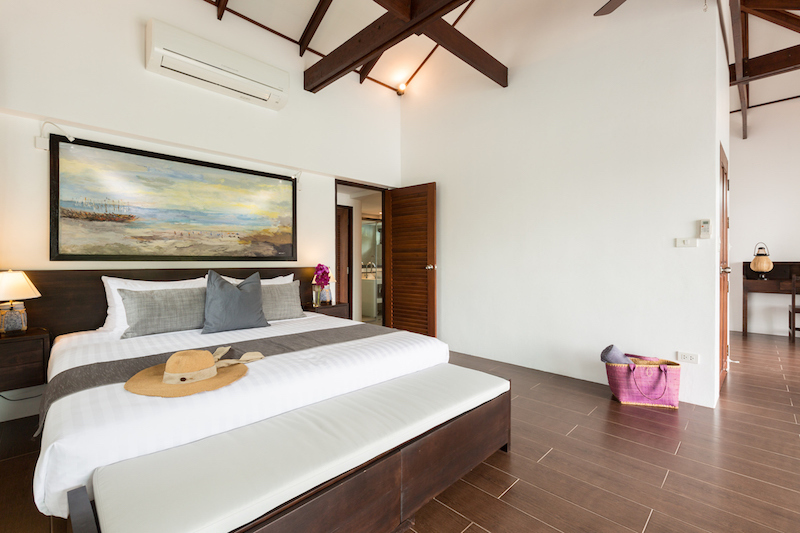 The villa can sleep up-to 12 persons in its six bedrooms, designed for 8 adults and 4 children, with 2 of the bedrooms aimed at children. 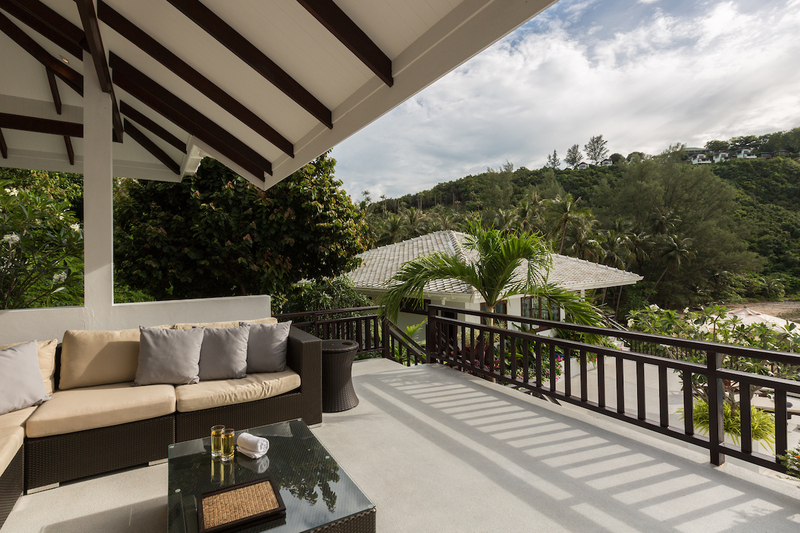 Each part of the villa is separated into pavilions and has a name for them, the principle villa, beach villa and honeymoon villa. 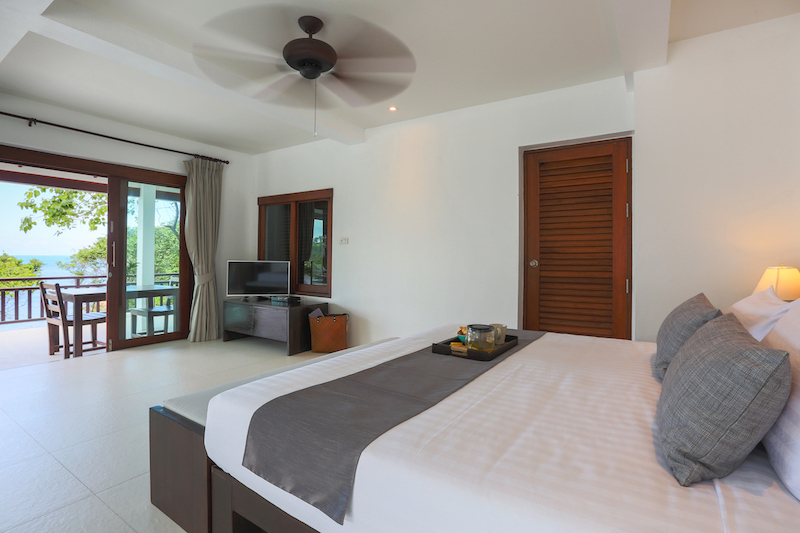 This has been done to distinguish the differences of each section of the sleeping and living areas of the villa. 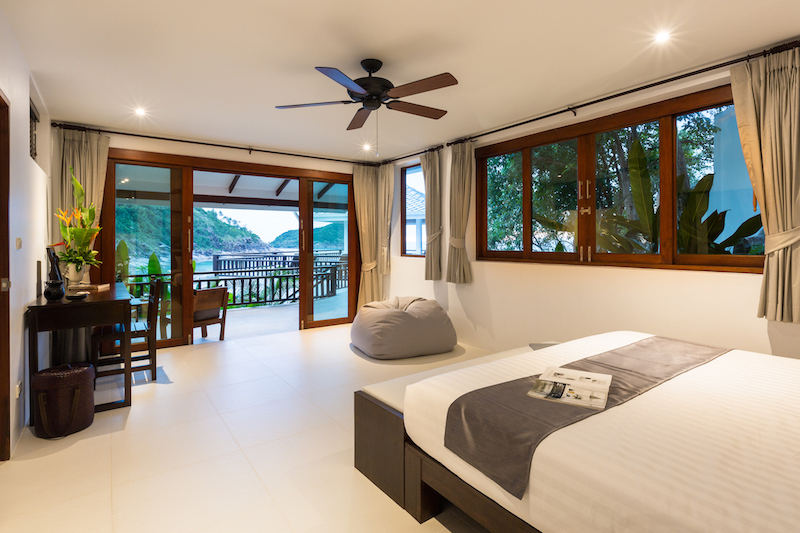 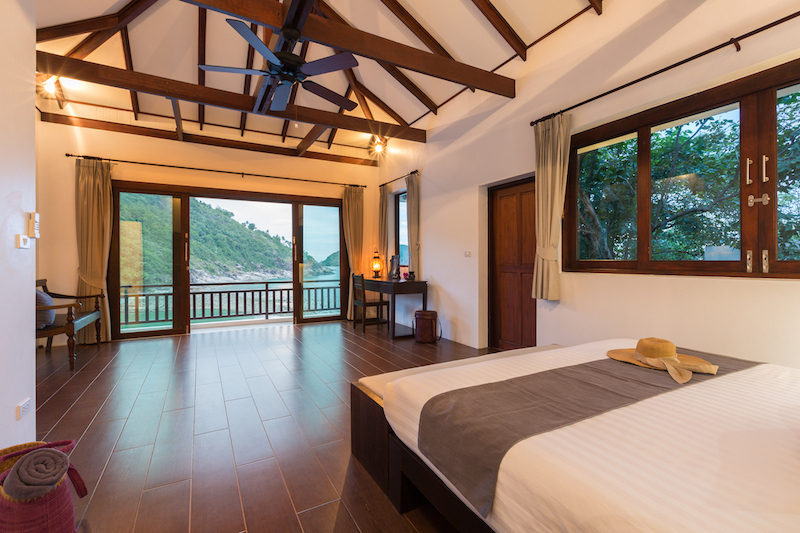 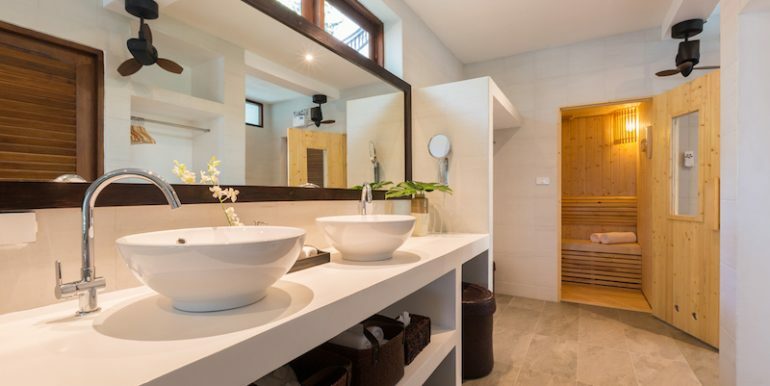 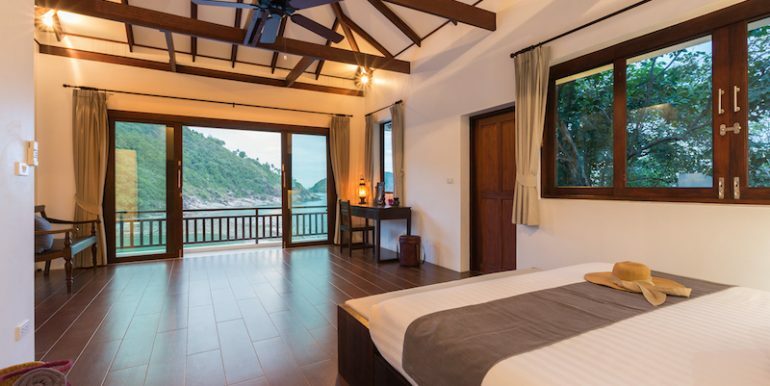 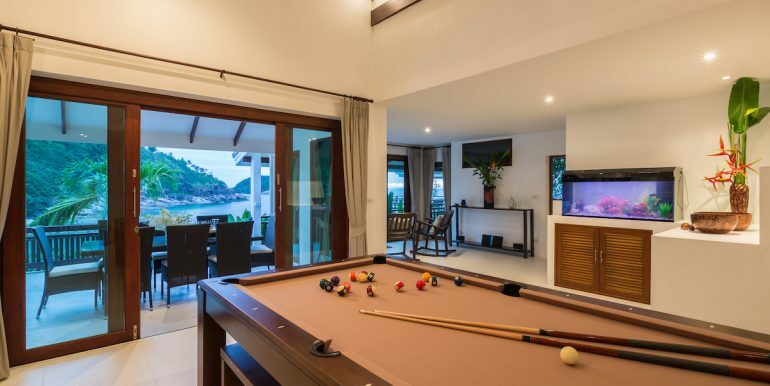 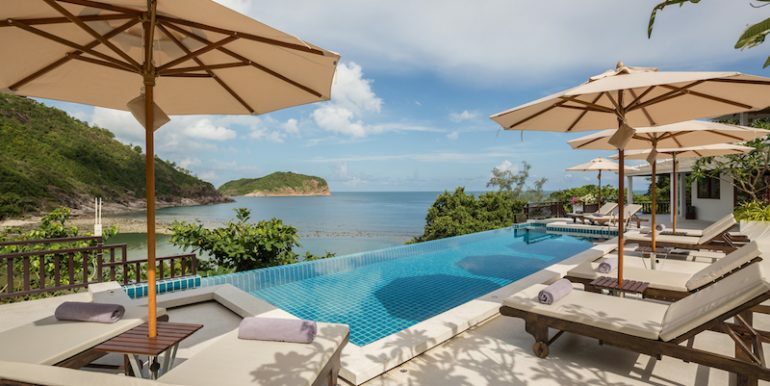 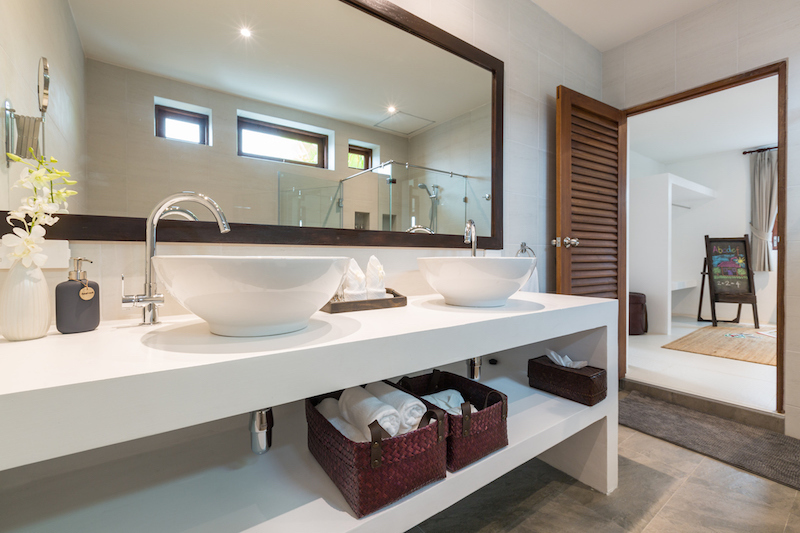 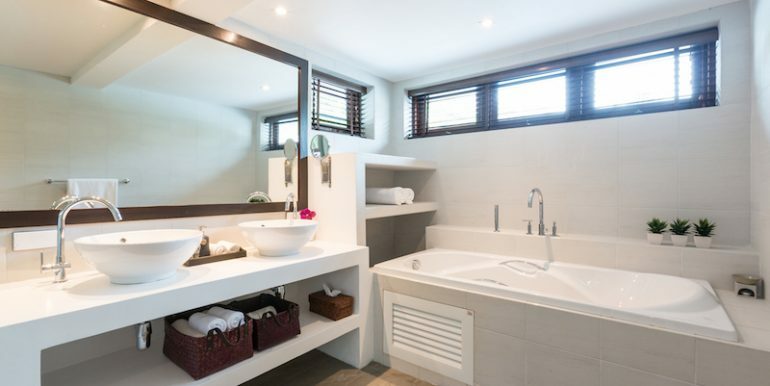 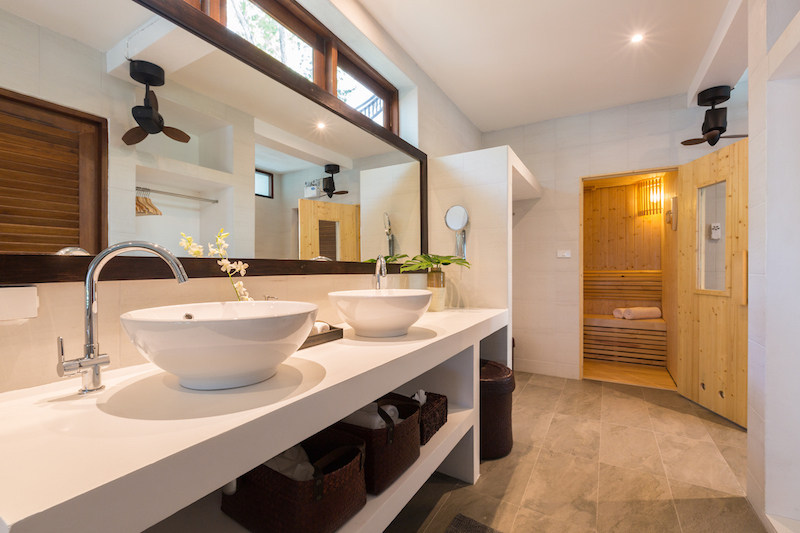 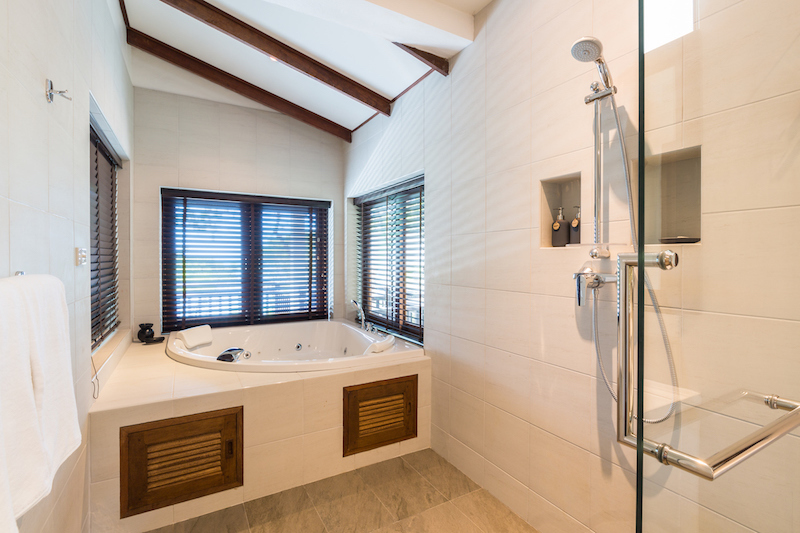 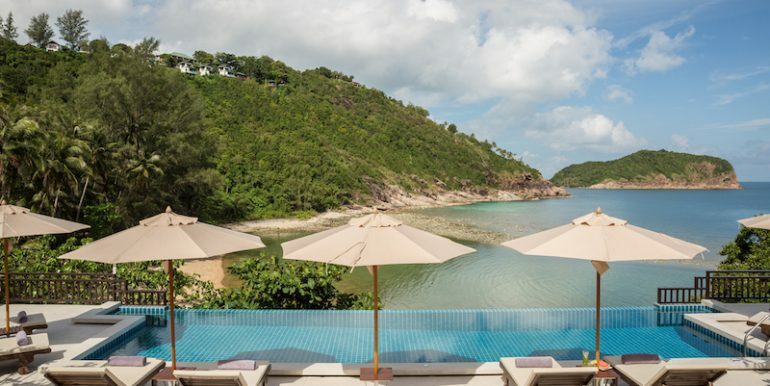 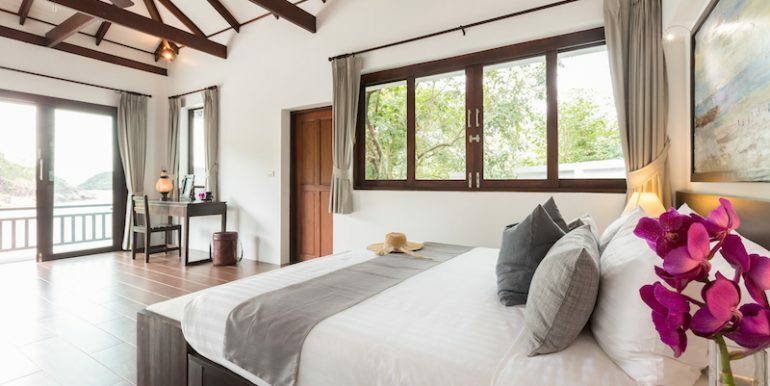 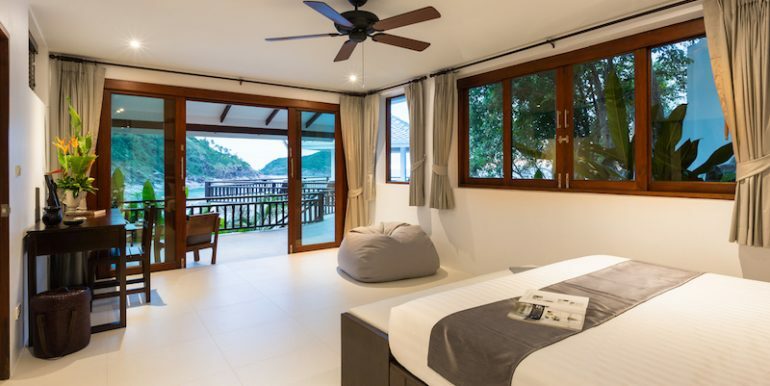 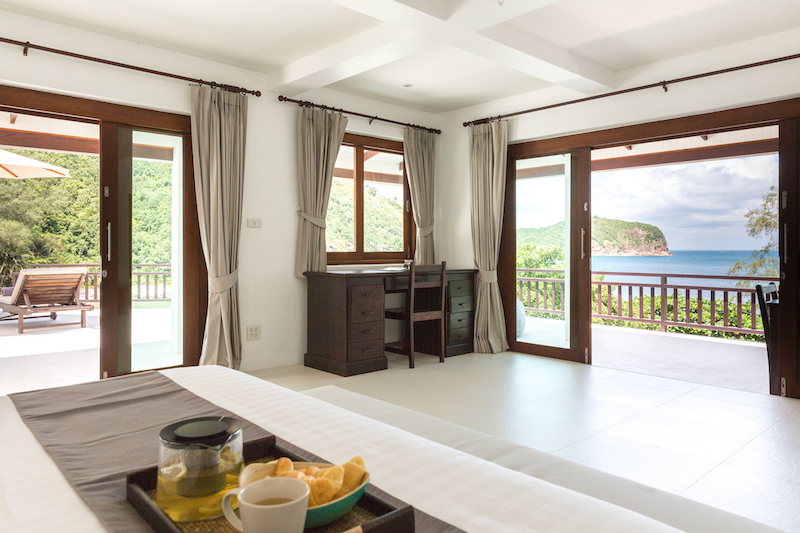 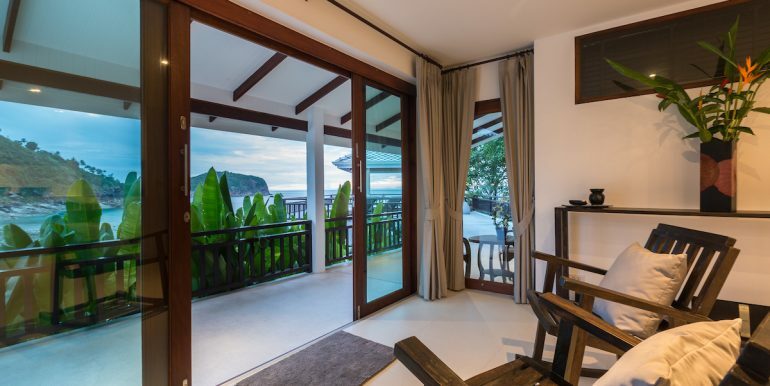 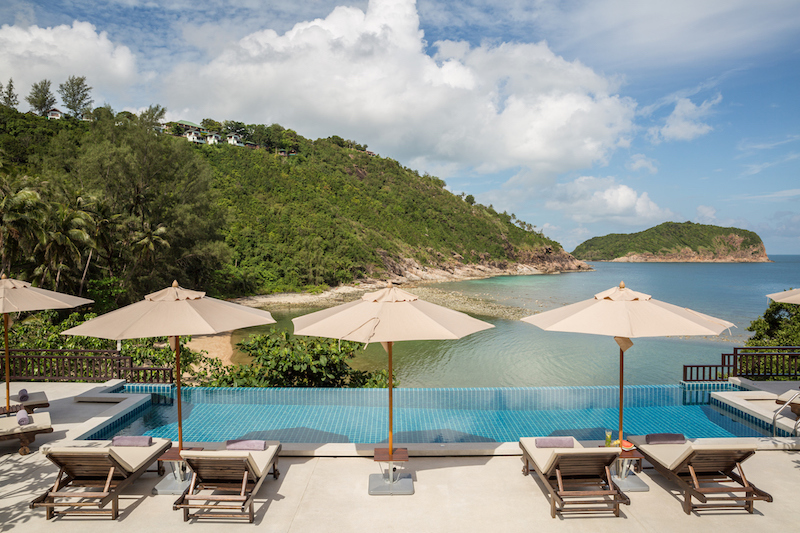 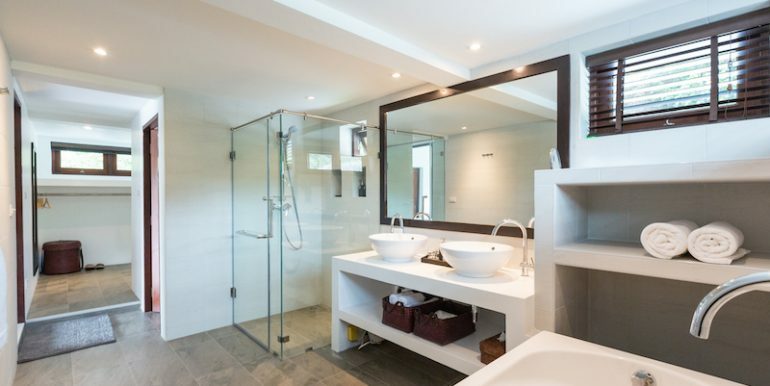 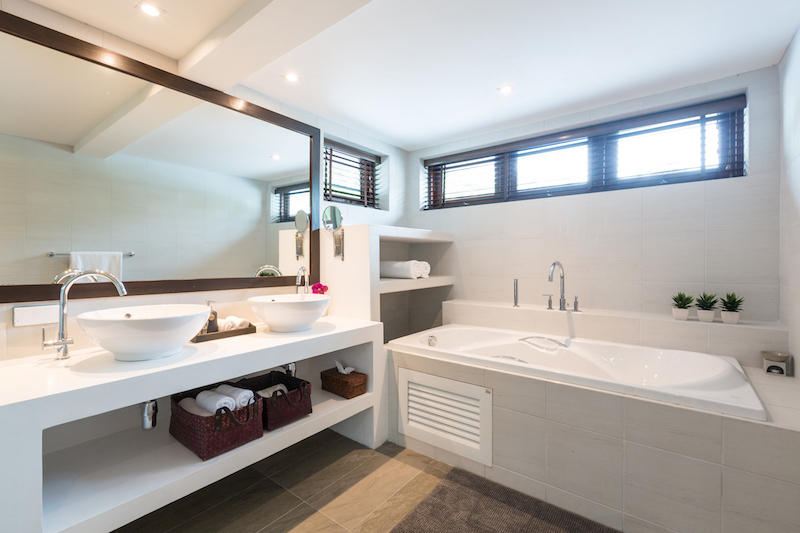 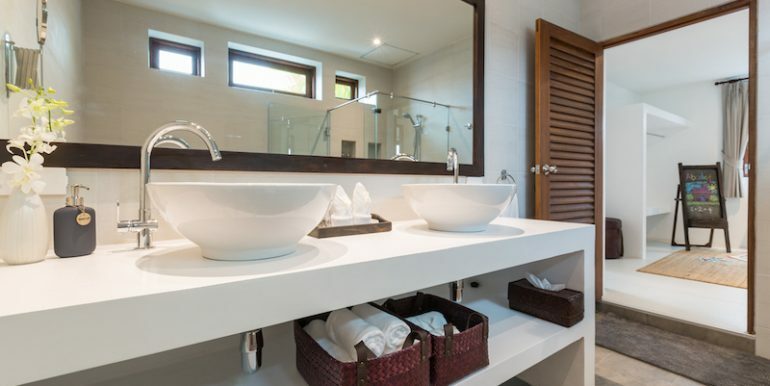 The Principal villa which is the main part of the villa has three rooms, the master suite which is on the upper floor which has a 180-degree views across the bay of Thong Lang, also an en-suite modern bathroom with bath tub, separate shower and two sinks. 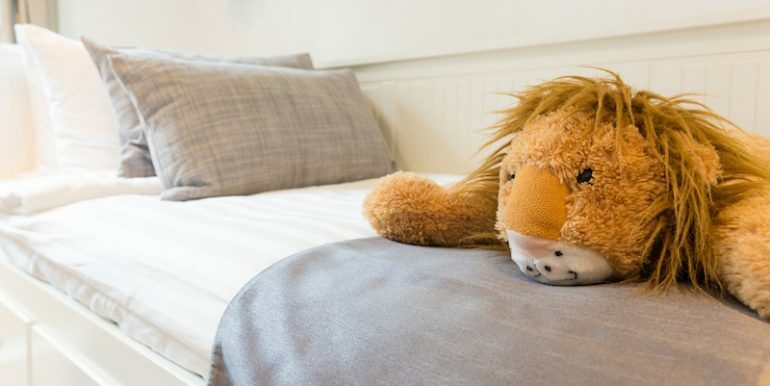 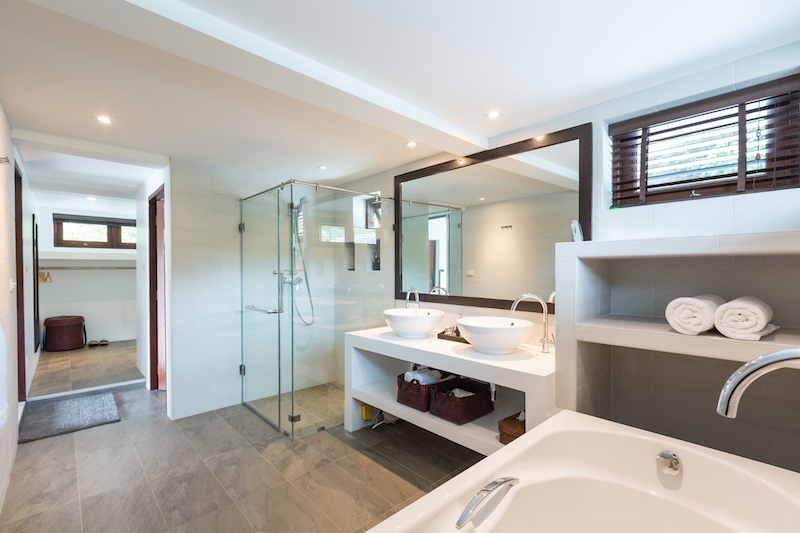 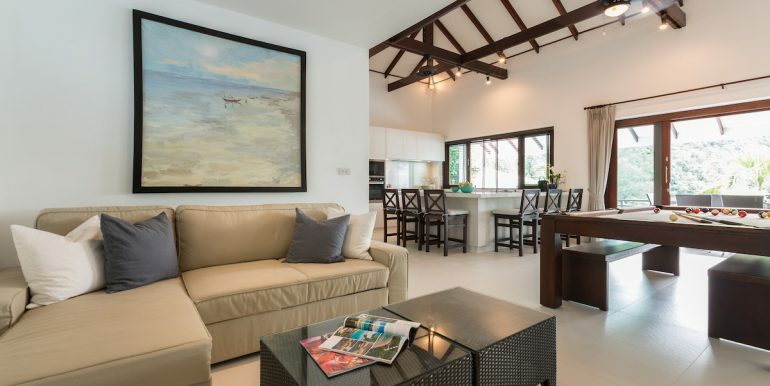 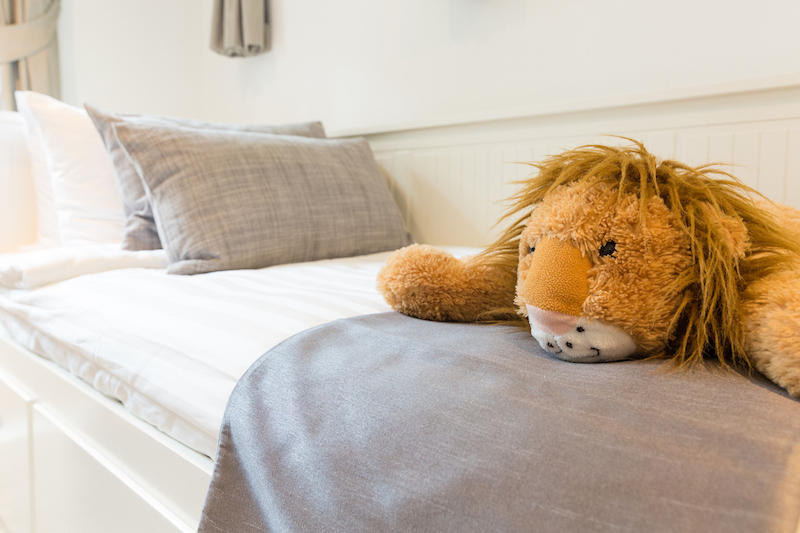 The ground floor of this villa has a main living area which has a family suite that connects the bedrooms sharing an en-suite bathroom, this works well for a family with young children. 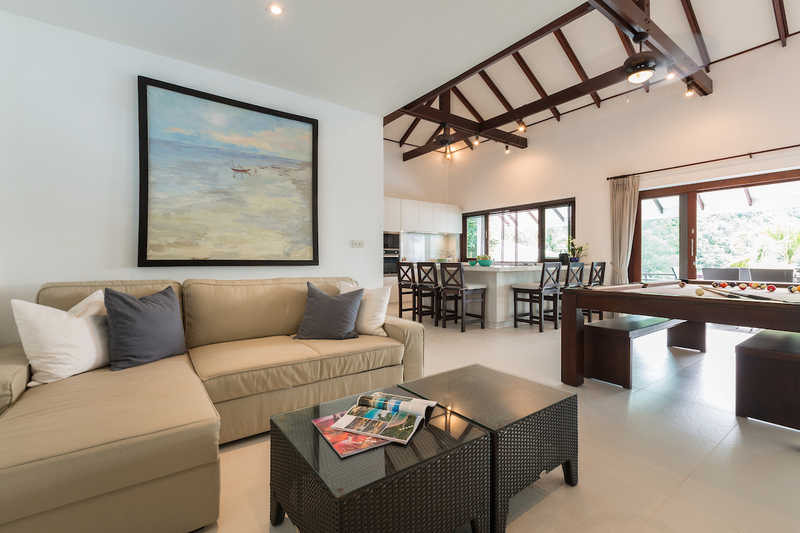 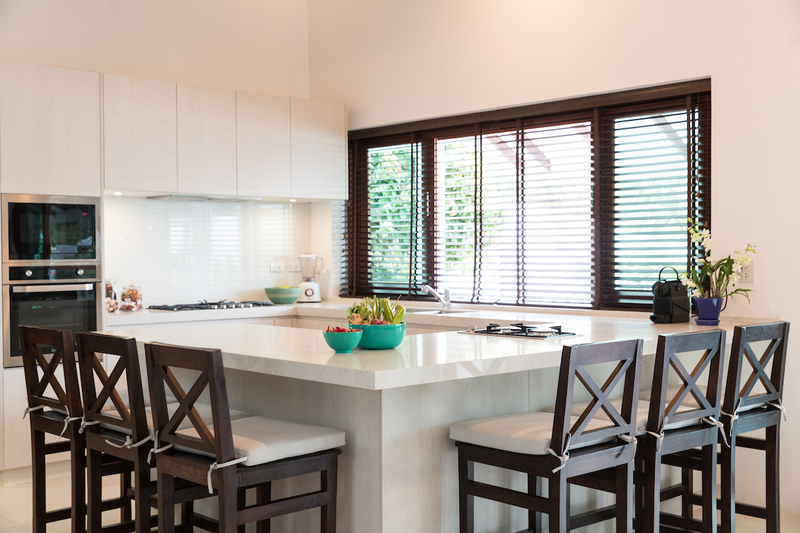 The main living area of the villa has a fully equipped open planned kitchen, western style, this is where the villa staff can prepare delicious meals. 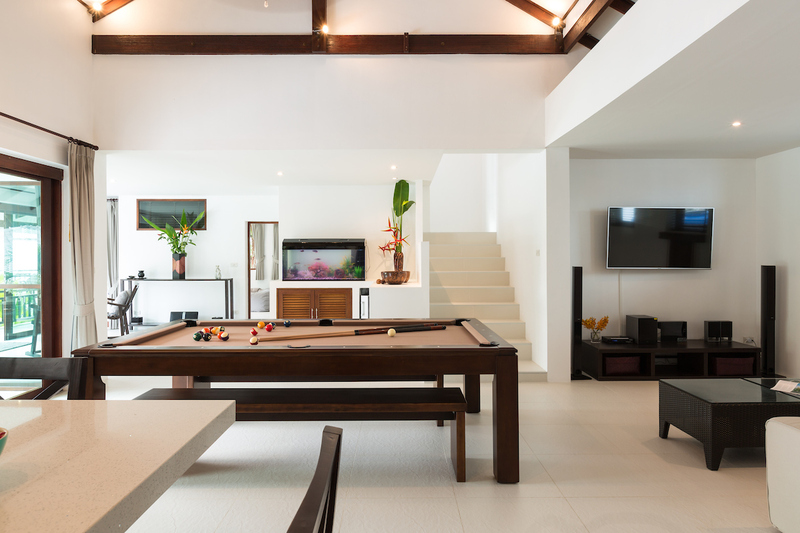 This area also has a large living room with TV game room, bar area and a pool table, if needed can also be used as a dining table. 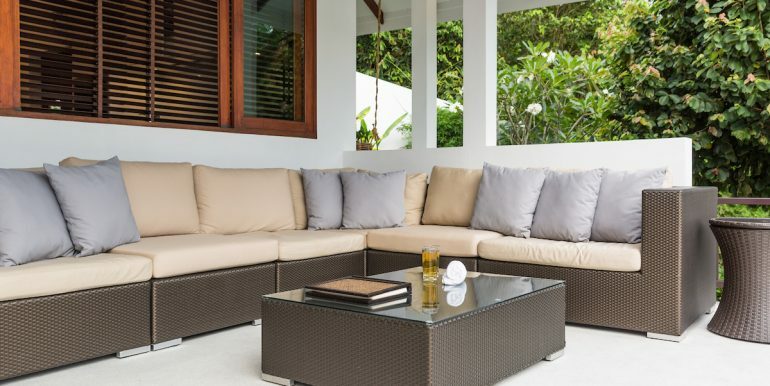 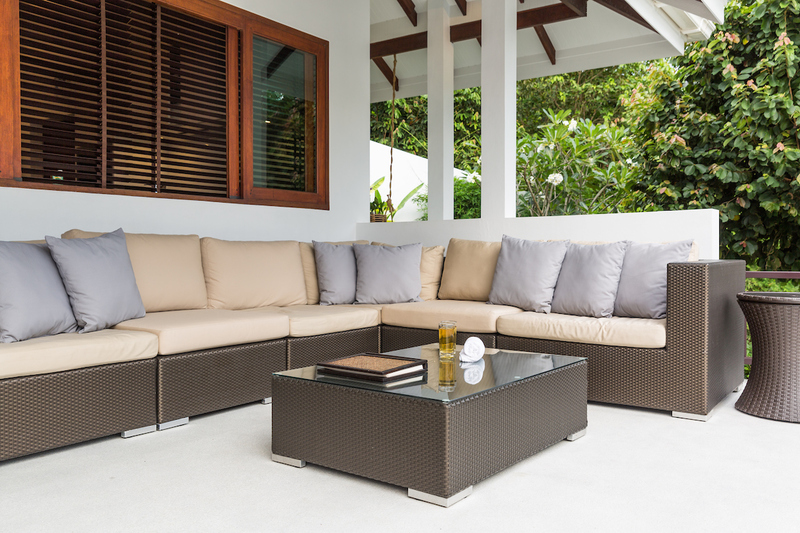 This living area has a huge terrace with outdoor dining area and poolside sala. 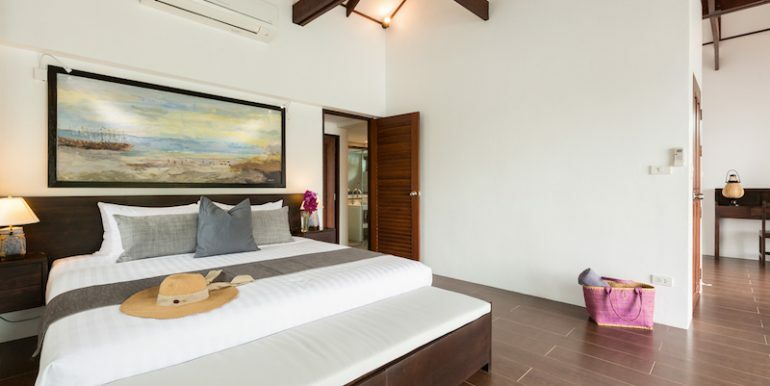 The poolside sala is perfect for massages which the villa staff can organize for you. 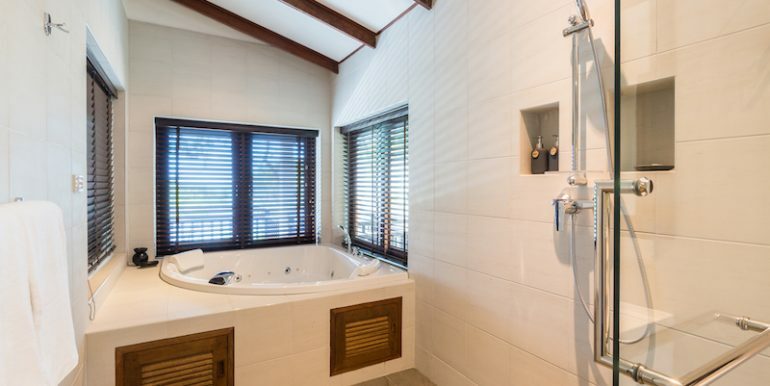 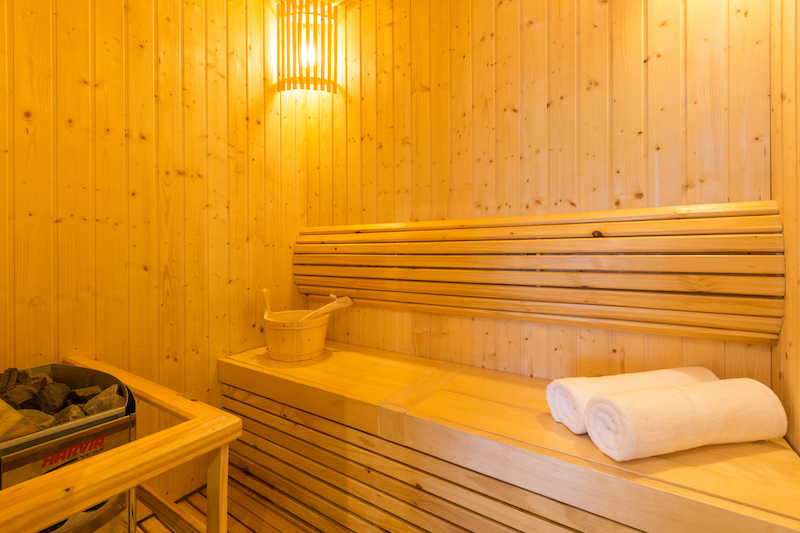 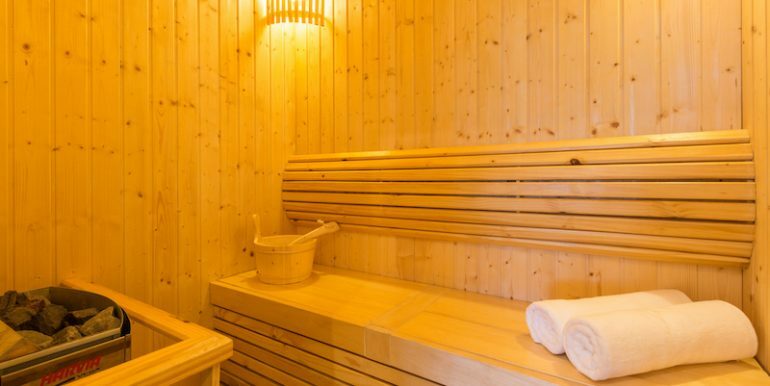 The Honeymoon villa with 1 bedroom has a Sauna, Jacuzzi Bath a kitchenette and direct access to the pool, gym and a only a few steps down to the beach. 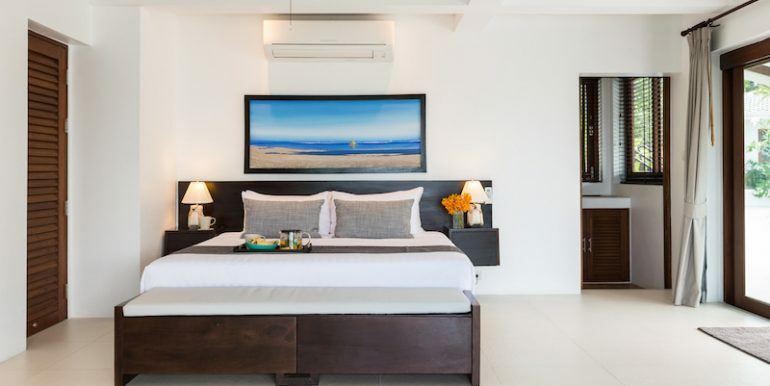 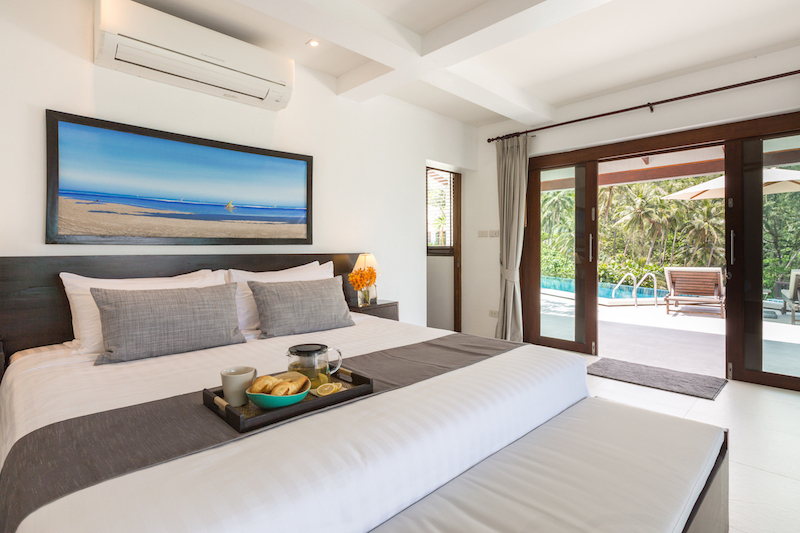 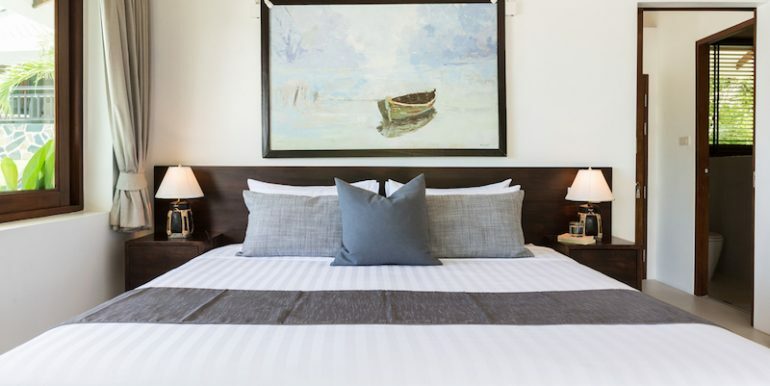 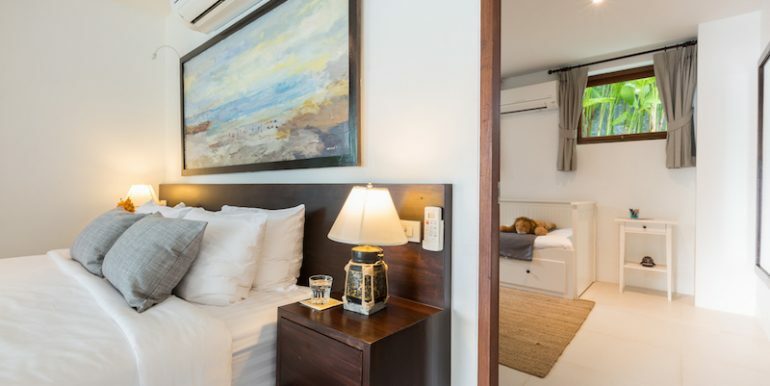 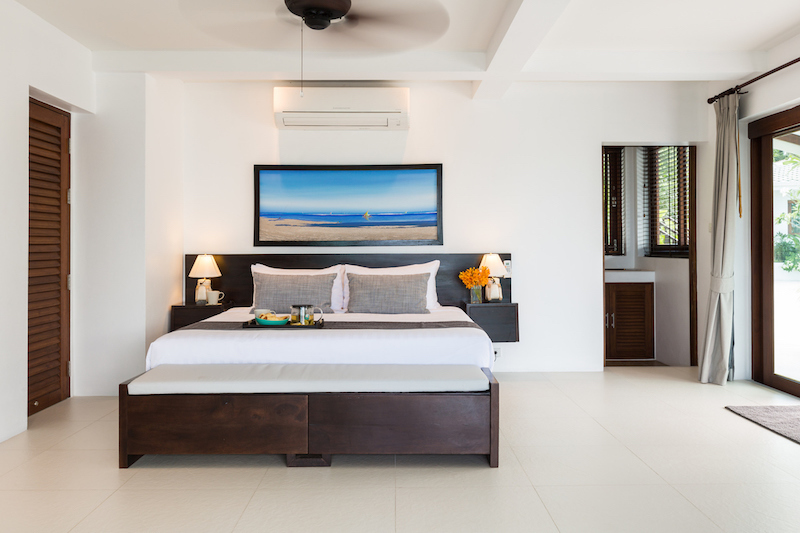 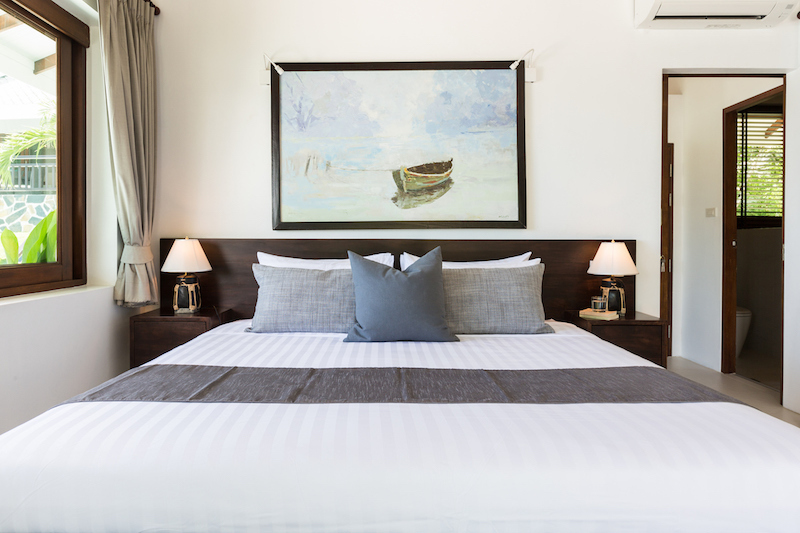 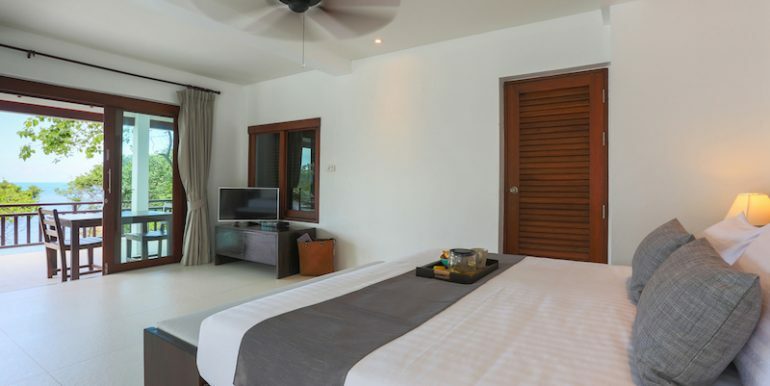 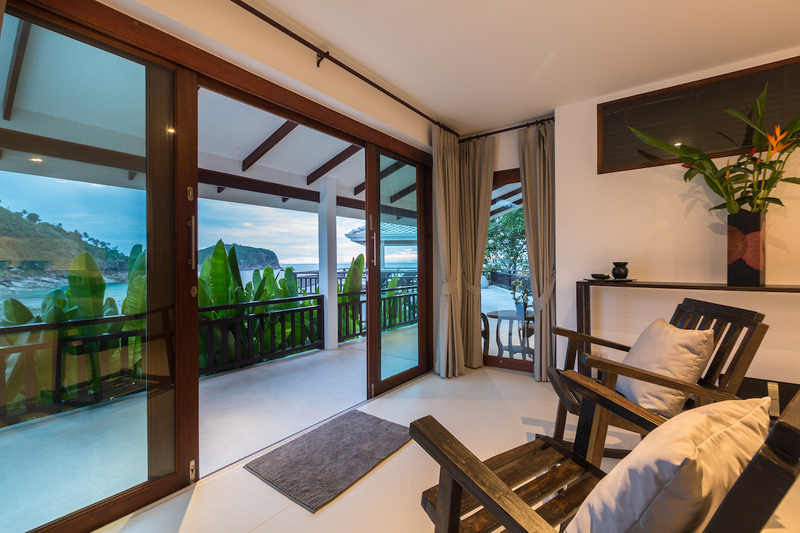 The Beach villa is also a 1 bedroom with a separate living room that can be transformed into another bedroom for children, so this works out well for a couple with children. 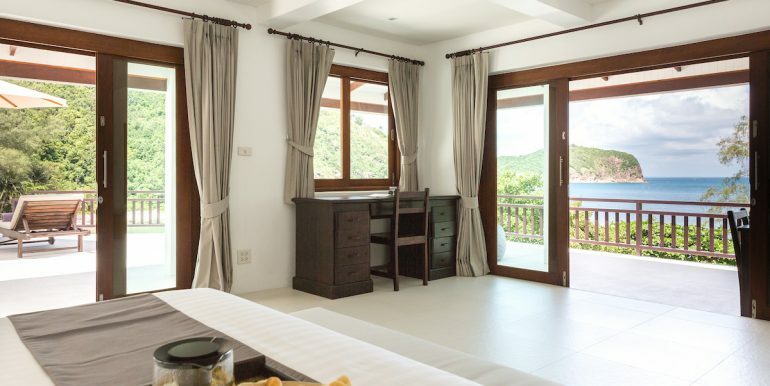 This villa also has a separate kitchenette that is connected with the outdoor terrace with table and chairs, also great views of the bay. 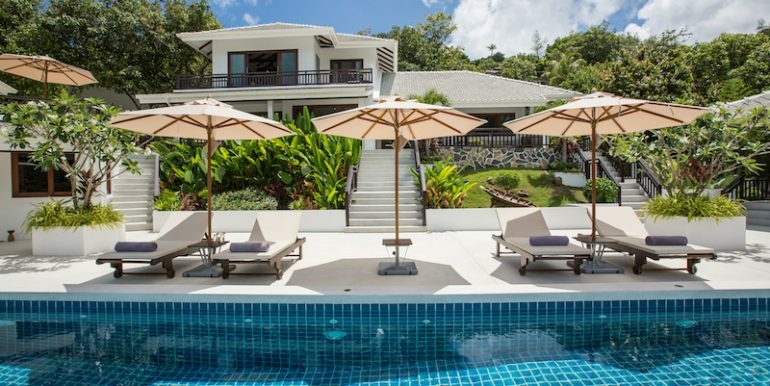 Overall the villa is a perfect place to relax and enjoy a chilled-out holiday. 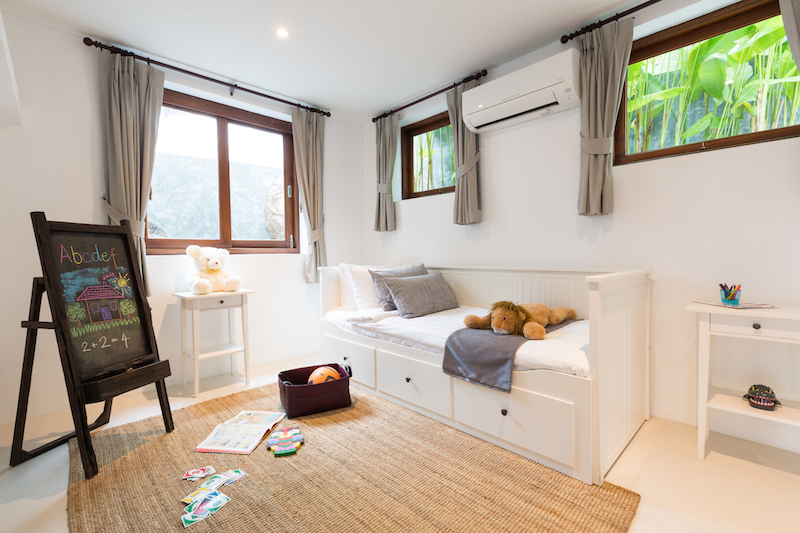 Designed for family or friends. 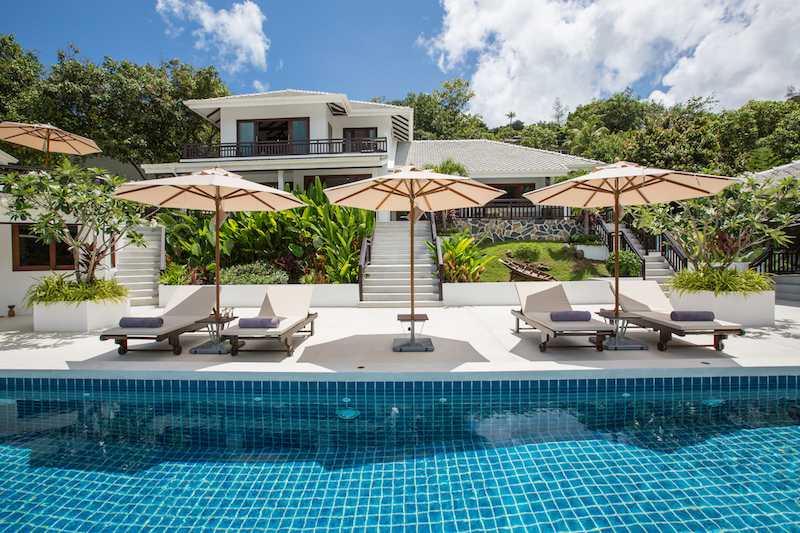 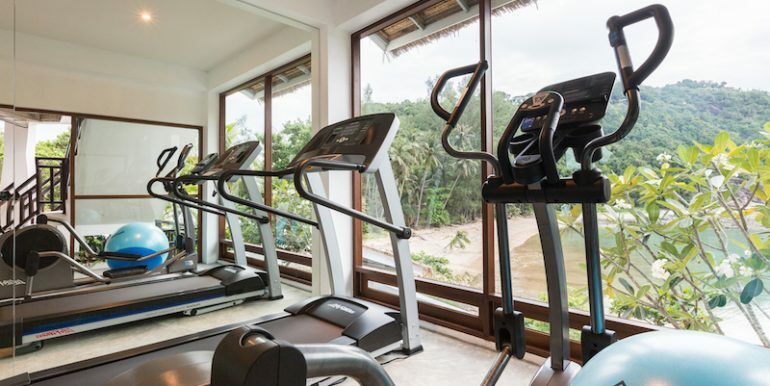 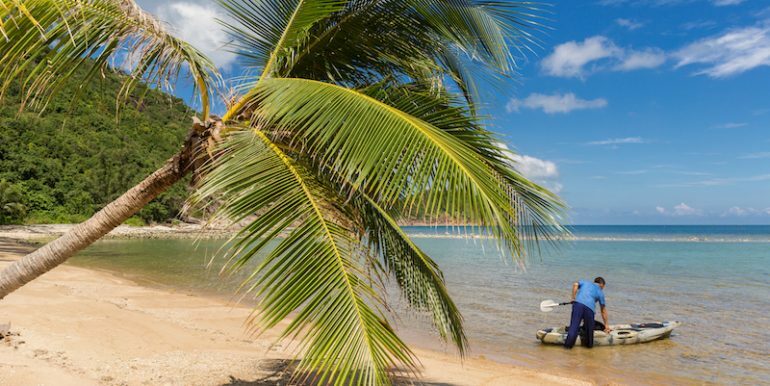 The villa staff are always on hand to assist you in anything you need or want to do, including starting up the barbecue, or using the private kayaks on the beach. 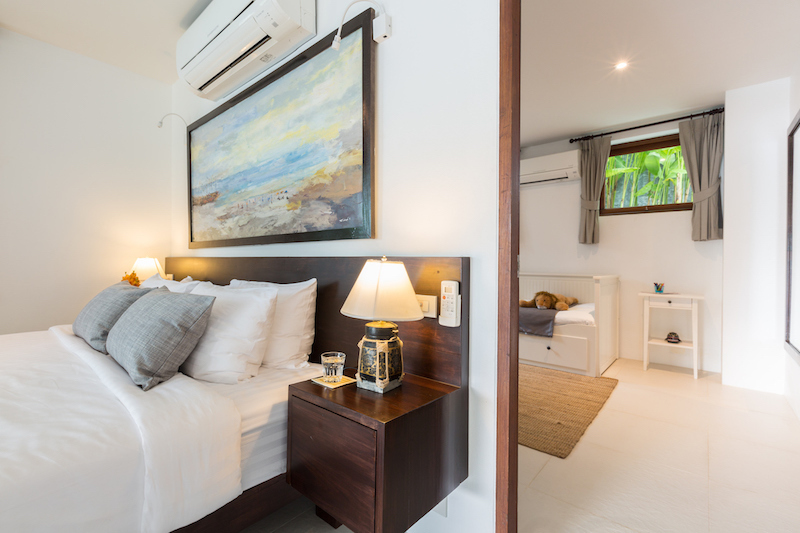 Within in minutes from the house the small fishing village of Chalouklum has an abundance of restaurants with fresh fish or European food and Thai food. 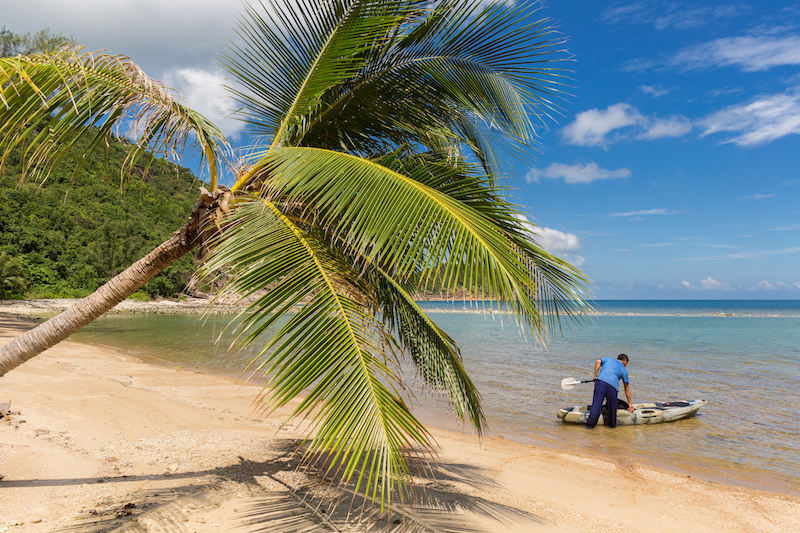 Also, one of the best beaches on the Island. 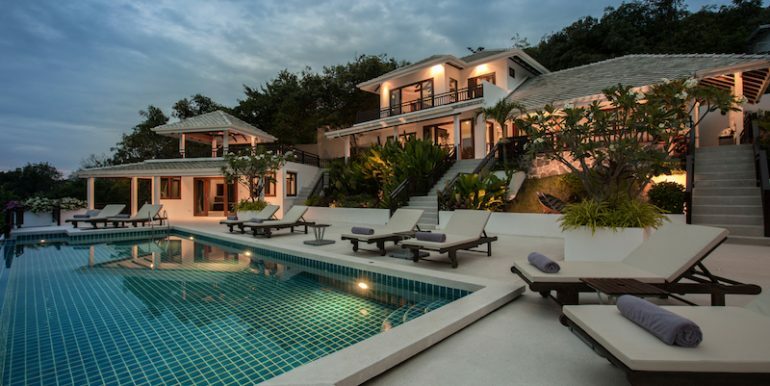 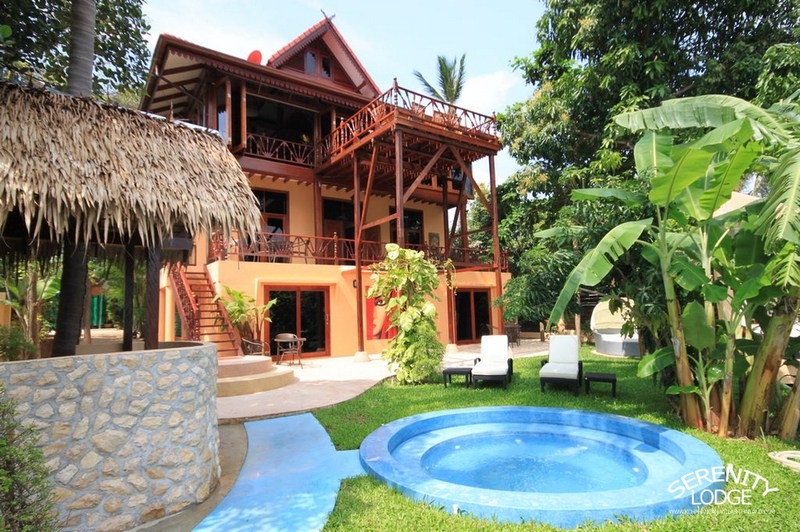 The villa is fully managed by a full-time manager who is on call to assist you. 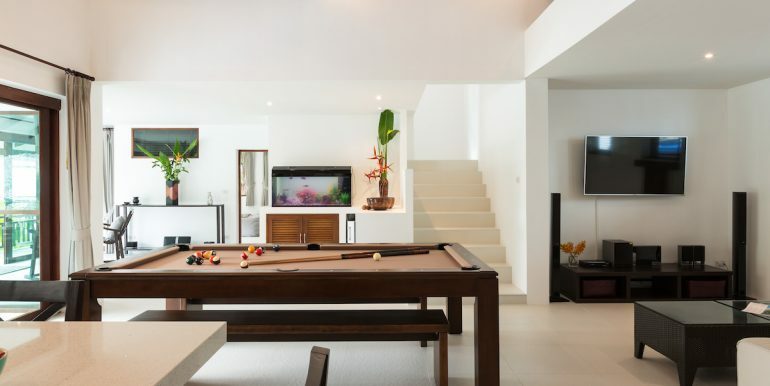 House keeping everyday, including laundry service if needed. 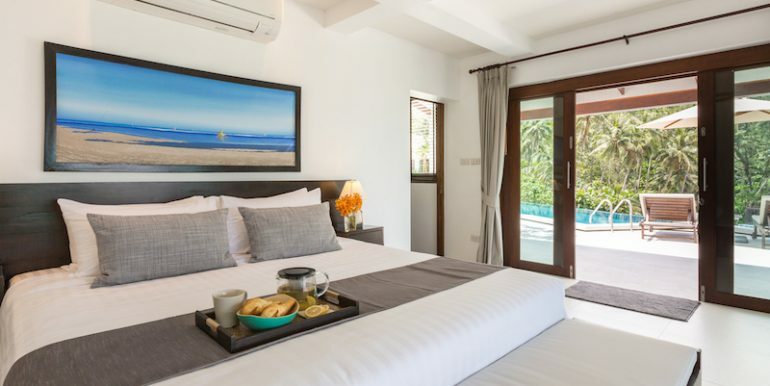 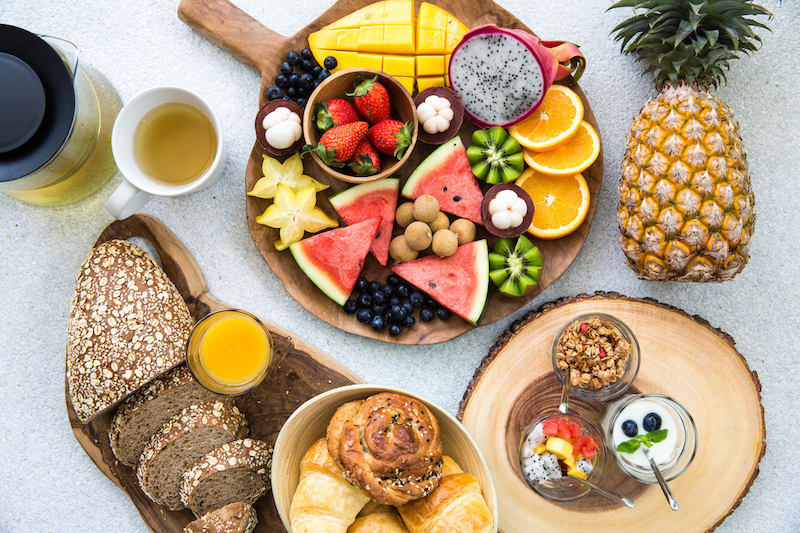 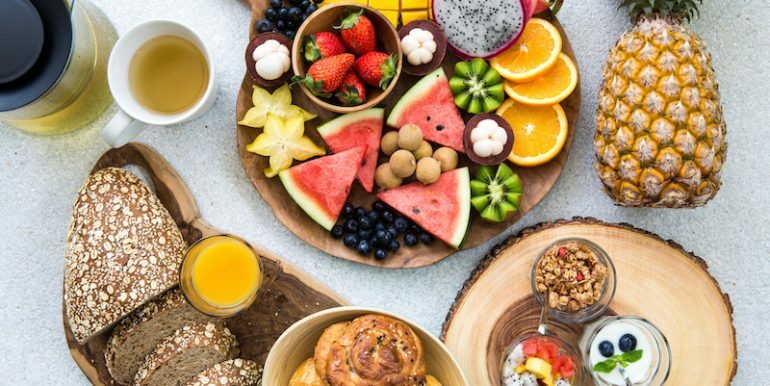 The villa has a skilled private chef who will prepare breakfast which is included and also prepare anything from Western, Asian, vegetarian and even has a children’s suggestion menus, as well as discuss special requests for special events. 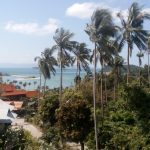 This villa its recommended you need a car or scooter, but taxi service can be arranged by the staff to go anywhere on Koh Phangan.